Coca-Cola doesn't have too many direct ties to the collector car hobby. There's the 'coke-bottle shape' of many muscle cars and the urban legend that you can use the soft drink to clean rust off chrome. 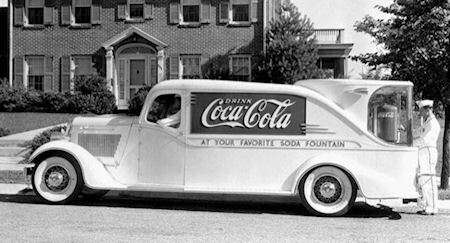 Coca-Cola in 1933 introduced the automatic fountain dispenser. Apparently, the company then decided to take the new fountain drink on the road the next year with a home sampling campaign.